Shopping for tires can be a confusing and difficult experience. Understanding what tire numbers mean, the differences in tire and tread types and what the manufacturer recommends for your vehicle can help. Meeting The Original Equipment (OE) Recommendations For Your Vehicle. Manny, Moe and Jack say, No short cuts. Tire sizes for both passenger vehicles and light trucks are usually represented by a combination of numbers and letters printed on the sidewall including a mandatory U.S. Department of Transportation (D.O.T.) approval code. Below are tips and information to help you learn how to read tire size and other tire markings commonly seen in the U.S. The size of most tires for both passenger vehicles and light trucks are represented by a combination of numbers and letters that are printed on the sidewall of your tires. Manny, Moe and Jack say, We've got your tires and hereâ€™s some help to pick them out! 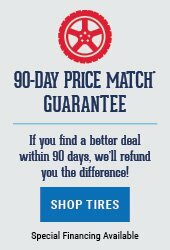 How in the world can I tell which tire I should roll with?